The misc pack is intended to cover mods that don't expose as many plank styles as the larger biome and tree mods (EBXL being a border case). As such, this pack may see future updates incorporating more mods. Screenshots below do not show all available variants. 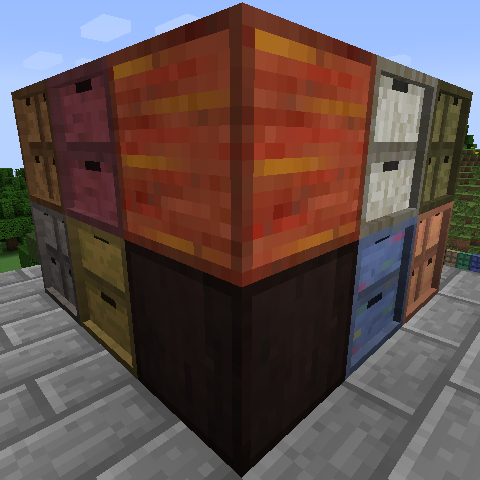 Look for the 'Storage Drawers Extras' mod for 1.12. It unified all the individual packs. Not all of the misc stuff is present, as not all mods are/were available at the time. Is there a 1.12.2 version of this? Good addon but the links to the mods are not working. This is an issue with curse itself, not necessarily the author. It'll work just fine then. This has applied to most broken Curse links I've found. Hope it helps! Maybe only register drawers if the correct mods are installed? For instance I have Witchery and Thaumcraft but not Extra Biomes XL or Highlands. The addons have more to do with the volume of custom texturing that needed to be created for each mod. I followed the Bibliocraft model in this sense, but whether I use the same model for 1.8+ remains to be seen. In the misc pack, most of the mods share the same block IDs, so I could try to hide them from the creative tab and NEI, but they're still sort of there. I've added the Botania livingwood and dreamwood woods. There's a third flowing rainbow type, but I'm not touching that. Is Botania on the list of mods to be added at some point? Its only 2 woods. Might I suggest adding the support for the aether mod. Not the most popular mod but it's very nice in some packs like the new Madpack(3). Also the links in the comments section don't appear to be working. The links to other mod pages? They work for me.